A typical antibody molecule (IgG, centre) has 12 domains, arranged in two heavy and two light (H and L) chains, linked through cysteine residues by disulphide bonds so that the domains lie together in pairs, the whole molecule having the shape of a flexible Y. In each chain the N-terminal domain is the most variable, the rest being relatively constant. Within the variable (V) regions, the maximum variation in amino acid sequence is seen in the six hypervariable regions (three per chain) which come together to form the antigen-binding site (bottom left in figure). The constant (C) regions vary mainly in those portions that interact with complement or various cell-surface receptors; the righthand part of the figure 1 shows the different features of the C region in the five classes of antibody: M, G, A, E and D. The result is a huge variety of molecules able to bring any antigen into contact with any one of several effective disposal mechanisms. The basic structure (MW about 160 000) can form dimers (IgA, MW 400 000) or pentamers (IgM, MW 900 000). 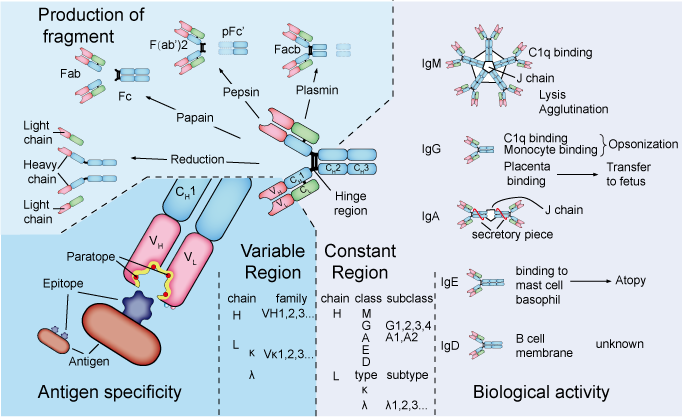 There are species differences, especially in the heavy chain subclasses, which have evolved comparatively recently; the examples shown here illustrate human antibodies. Interestingly, camels and llamas also have antibodies with only heavy chains. These antibodies may be able to attach to some targets not accessible to conventional antibodies, and examples are being tested as possible new ways of preventing infection by viruses such as HIV. Figure 1. Knowledge of immunoglobulins. Produced by chemical treatment: these fragments were of great importance in elucidating the chemical structure of antibody. Fab and F(ab‘)2 fragments allow binding to specific antigen in the absence of secondary interactions with other cells mediated via the constant region. • H, L: heavy and light chains which, being only disulphide-linked, separate under reducing conditions. • Fab: antigen-binding fragment (papain digestion). • Fc: crystallizable (because relatively homogeneous) fragment (papain digestion). • F(ab)2: two Fab fragments united by disulphide bonds (pepsin digestion). The strength of binding between one V domain and an antigen is called the affinity of the antibody. Typically, it is of the order of 108 L/mol or above. However, antibody molecules have 2, or in the case of IgM 10, identical binding domains. If the antigen recognized also has repeated units, such as the surface of many bacteria or viruses, one antibody molecule can make multiple attachments to the same target antigen. The strength of this overall binding is known as the antibody’s avidity. It can be much greater than the affinity, typically 100 times more for a divalent antibody and up to 100 000 times more for IgM. Physical, antigenic and functional variations between constant regions define the five main classes of heavy chain: M, G, A, E and D. These are different molecules, all of which are present in all members of most of the higher species. IgM: is usually the first class of antibody made in a response and is also thought to have been the first to appear during evolution. Because its pentameric structure gives it up to 10 antigencombining sites, it can show high avidity, even though it may have a relatively low specific affinity. It is therefore extremely efficient at binding and agglutinating microorganisms early in the response. However, it is also very efficient at making larger immune complexes, which can activate unwanted inflammation and disease. Its production is therefore downregulated as soon as sufficient IgG has been generated. IgG: is a later development that owes its value to the ability of its Fc portion to bind avidly to C1q and to receptors on phagocytic cells. It also gains access to the extravascular spaces and (via the placenta) to the fetus. In most species, IgG has become further diversified into subclasses. IgA: is the major antibody of secretions such as tears, sweat and the contents of lungs, gut, urine, etc., where, thanks to its secretory piece, it avoids digestion. It blocks the entry of microorganisms from these external surfaces to the tissues themselves. IgE: is a curious molecule whose main property is to bind to mast cells and promote their degranulation. IgD: appears to function only on the surface of B cells, where it may have some regulatory role. In the mouse it is unusual in having two instead of three constant regions in the heavy chain. Subclasses, subtypes: Within classes, smaller variations between constant regions define the subclasses found in different molecules of all members of an individual species. The IgG subclasses are generally the most varied. All these variants found in all individuals of a species are called ‘isotypic’. Both flexibility and proteolytic digestion are facilitated by the repeated proline residues in this part of the molecule. In IgM, the hinge region is as large as a normal domain, and is called CH2, so that the other two constant region domains are called CH3 and CH4. J chain: A glycopeptide molecule that aids polymerization of IgA and IgM. Secretory piece: A polypeptide derived from the poly-Ig receptor and added to IgA dimers in epithelial cells to enable them to be transported across the epithelium and secreted into the gut, tears, milk, etc. where IgA predominates.